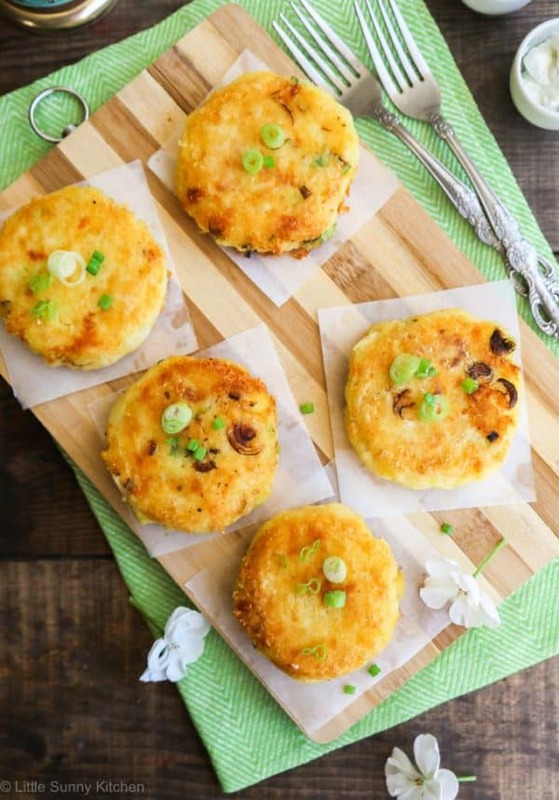 Potato cakes that are made with leftover mashed potatoes. 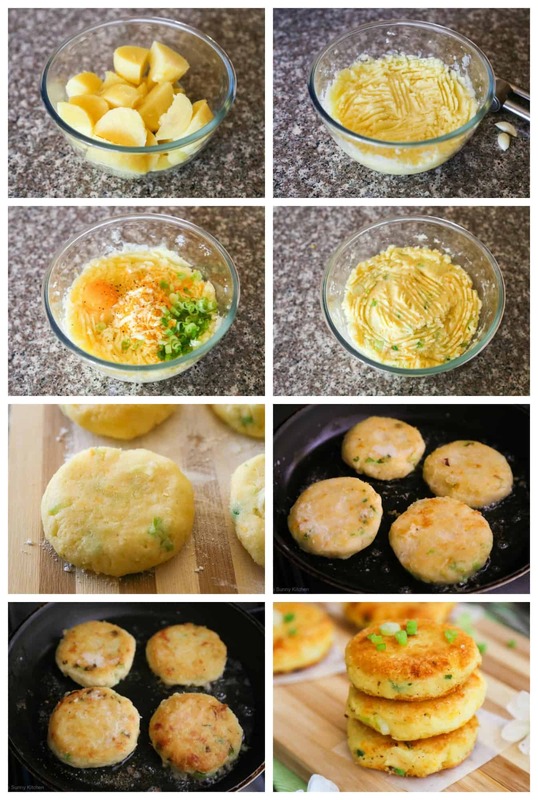 These lovely Cheesy Mashed Potato Cakes that are soft from the inside, but golden and crispy from the outside! Make sure to check out my Vegan potato cakes with rice and carrot, they’re to die for! The long awaited summer is finally here! And so is the long summer school vacation. There are lots of activities and outings planned for this season, be it: swimming, sunbathing, playing in the park, hiking, travelling, planning picnics and BBQs, meeting friends outside and discovering new places. But when it’s raining outside, there’s not much to do. Or is there? Well, we still need to keep our kids busy while staying indoors, knowing how the British summers are! And we miss the luxury of just getting them out and let them occupy themselves with less guidance and supervision needed by adults. So when it’s raining, we stay indoors. Would that mean we get more free time to do things we plan to do? With kids around, it’s never the case! On the contrary, when we stay indoors we need to plan things more carefully. We organise playdates, we paint, we play board games, we do pretend play. And yes, when I say “we” I do mean it. Parents and children do more things together while staying inside, simply to avoid any “catastrophic” situations which we could end up with if kids are left to spend time alone. So I just sit with them on the floor and we do different things together. But what about food? After spending hours playing with kids, I end up having little time to prepare something to eat. Or shall I just order a take out? Would it be a healthy option to feed those little growing bodies with takeaway meals? Instead of ordering some pizzas I’d rather just cook something quick, healthy, nutritious and delicious and enjoy it all together. An excellent example of that is this recipe! These potato cakes are sort of like veggie fritters, but they’re made from leftover mashed potatoes. With a crunchy exterior and creamy interior, your kids will love these potato cakes! You should also try these corn fritters, this recipe is 100% family approved. 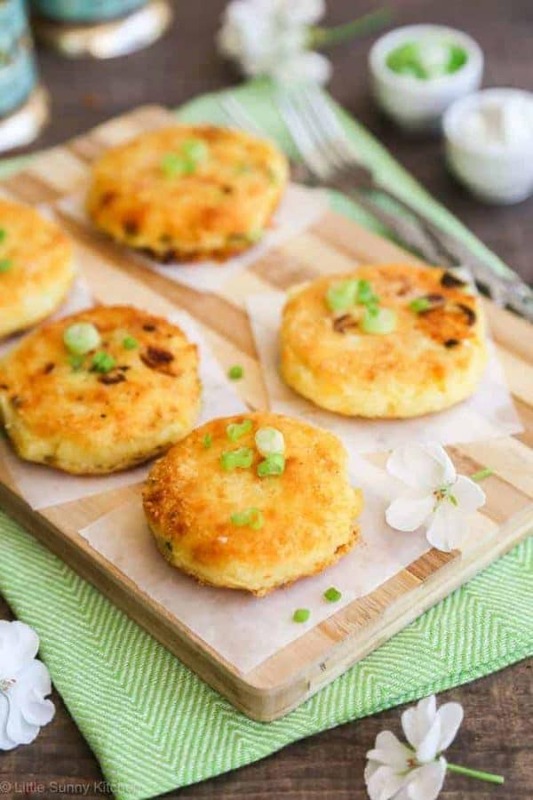 These warm, crispy cheesy mashed potato cakes can be prepared in no time, actually, they’re ready in under 20 minutes! Simply boil a few potatoes and mash them (I use this potato ricer) adding a pinch of salt and ground black pepper, or use leftover mashed potato if you have any. If you’re using leftover mashed potatoes, then make sure that you didn’t add too much milk and butter to make the mashed potatoes extra smooth. Ideally, mashed potatoes need to be quite thick to hold shape otherwise you will end up adding too much flour and that will result in bland potato cakes. I also noticed that store-bought mashed potatoes don’t work very well to make potato cakes, so make sure that you’re using homemade mashed potatoes for this recipe to work. Add an egg, shredded cheddar cheese, chopped herbs, and some garlic. I used chopped scallions and it tasted great. You could also add curry powder or any other seasoning that you like. Mix all ingredients together then divide into 100 gm portions to create little cakes. Roll each portion into a ball then gently flatten into a cake about a 1.5-inch-thick. Dredge each cake in cornstarch and fry in vegetable oil until golden brown and crispy on both sides. Finally, transfer the cakes to a towel-lined plate and serve them warm. What I love about this recipe, is that it requires shallow frying rather than deep frying and that’s always a win! I would recommend serving these potato cakes while they’re still warm, but I’m always happy to eat them even if they’re already cold. Potato Masher; this potato masher is perfect for making smooth mashed potatoes and it’s safe to use in nonstick pots. Or a potato ricer (I really like this one). IKEA garlic press; This is the only garlic press that I ever use! It’s the best model that I’ve used so far as all of the garlic gets squeezed out, and none gets stick inside the press. My Mum and sister use the same one as well so it’s highly recommended. Plus I don’t think that it can ever break, so if you need a new garlic press then this is a great choice. Large frying pan; to shallow fry the potato cakes you will need a large nonstick pan. Frying the cakes in a small one will take you ages, and if they start sticking to the bottom of the pan then they can get ruined. These potato cakes can also be served with a teaspoon of sour cream and dill on each, which I find very refreshing. The Scottish version of these potato cakes is called Tattie Scones, however, they don’t use an egg and just add butter and salt to the boiled and mashed potatoes. They’re also thinner than these potato cakes, and use dry and light potatoes in the recipe. If you make these potato cakes, please don’t forget to rate this recipe and share a picture on social media. Tag #LittleSunnyKitchen in your posts as I would really love to see what you make! Thank you for supporting Little Sunny Kitchen, so I can keep sharing my tasty recipes with you for free. Boil the potatoes and mash them with a potato masher adding a pinch of salt and a bit of butter. Add one egg, shredded cheddar cheese, chopped herbs like scallions, one clove of garlic (crushed). Mix all ingredients together and then divide into mixture into 100 gm portions each. Roll each portion into a ball then flatten it into a cake of about a 1.5-inch-thick. Dredge each cake in corn starch and fry in vegetable oil until golden brown and crispy on both sides. Transfer the cakes to a towel-lined plate and serve hot. Tip: Use a cookie cutter to cut out fun shapes before cooking if you're making these potato cakes for your little ones! This post contains affiliate links, which means that I get a small commission if you purchase a product using my link at no extra cost to you. Thank you for supporting Little Sunny Kitchen and making it possible for me to do what I love; sharing my favourite recipes with you for free! Now to reconstruct to make these Vegan? Just wondering why you’ve added eggs and cheese when the site states you are a Vegan Chef…could you give a Vegan option please. I’m allergic to Dairy and Eggs, whoops sorry! Diana, it’s really awesome! This will quickly become a favorite in our house! Will it work if I put them in the oven? I’d like to avoid deep fry.. I haven’t tested baking these potato cakes, but I would recommend shallow frying them with a little bit of oil. I wish people would leave more helpful comments about the recipe. I made these tonight with left over mash potatoes, I didn’t have cornstarch but I used flour which worked out just fine. Be sure to add salt n pepper if you like it. I also chopped up some green onions and mixed them in. They are delicious and a good way to use up leftover mash potatoes. Will make these again! I always thought that potato and cheese is an amazing combination! Potatoes + Scallion = I’m in LOVE ! Is it okay If i eat them all and not share ? Yummy! Definitely would be trying this out . It’s so easy to to make especially with the kids . Annnd who can resist anything with cheese and potatoes .Thanks for sharing!!! I LOVE mashed potato cakes, but I have never tried adding cheese to them. What an awesome idea. Thanks! 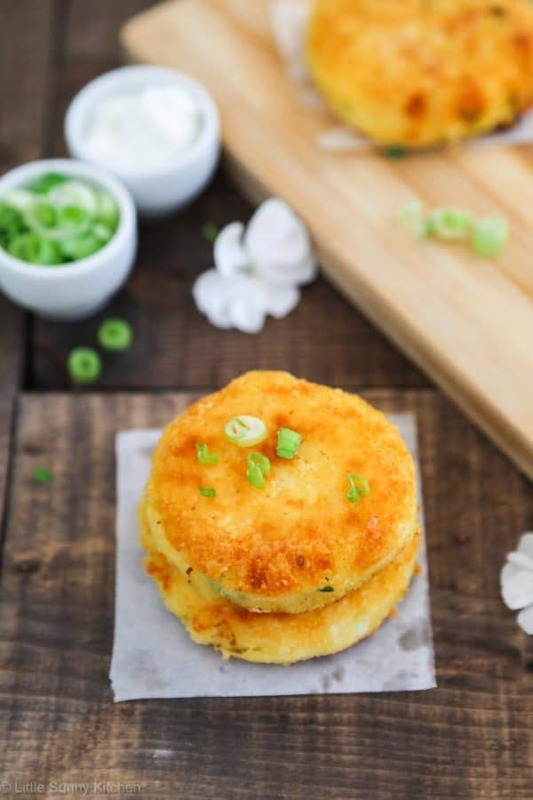 Mashed potato cakes are the best, we love adding cheese as it adds a lot to the flavour! But we also love them plain without the cheese 🙂 yum! I love potatoes and I can eat them all the time. I love that you added cheddar cheese to potato cakes. Must be sooooo good! I also really love potatoes and all the great dishes that you can make with them! these look so good, cheese and potatoes are the perfect combination and these cakes would make great leftovers for breakfast. Omg! How adorable are these little potato cakes? I wouldn’t want to eat them on the basis of them looking so cute. Your photography is amazing btw. Beautiful styling! These potato cakes look amazing. Definitely sounds like the perfect texture. These look utterly delicious that I’ve pinned the recipe so that I can make them. Let’s hope for a warm dry summer! I miss those days of playing with my little ones! They’re young adults now, but still ask, “What’s for dinner?” My family would love these potato cakes. They look so delicious! Uhm, these look amazing! I’ve never tried potato pancakes before but now I think I’ll have to! my kids will go nuts over these! Look so good! These potato cakes look scrumptious! I am from Ukraine, and my mom cooks similar cakes. They are my family’s favorite! These were very good . As my boy and his friends said said they are the bomb!